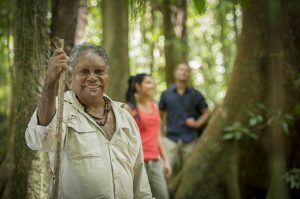 Voyages Indigenous Tourism Australia’s Mossman Gorge Centre has received the prestigious Gold Qantas Award for Aboriginal and Torres Strait Islander Tourism in the Queensland Tourism Awards, which took place on Friday 16 November at The Star Gold Coast. “Excellence in Indigenous Tourism is core to our vision at Voyages Indigenous Tourism Australia. To receive the Gold award for the third time in this category is a great testament to the dedication of the team at Mossman Gorge Centre and their passion for delivering an exceptional tourism experience for our guests,” said Voyages Chief Executive Officer, Grant Hunt. Mossman Gorge Centre is an Indigenous eco-tourism development serving the Mossman Gorge World Heritage site in Far North Queensland. The Queensland Tourism Award was awarded for Mossman Gorge Centre’s impressive product which offers visitors a genuine insight into Indigenous Australia and authentic engagement with the local Kuku Yalanji people through Dreamtime Gorge Walks incorporating culture, history and storytelling on private Kuku Yalanji country in the heart of the rainforest. Mossman Gorge Centre also delivers significant economic, employment and training opportunities for the local Kuku Yalanji people. The Qantas Award for Aboriginal & Torres Strait Islander Tourism recognises tourism operations that demonstrate authenticity and cultivate a greater understanding of Aboriginal and Torres Strait Islander culture, history and traditions. Mossman Gorge Centre has now been the Gold award winner in this category three times: in 2018, 2016 and 2014. Queensland Tourism Award winners will represent the state at the Qantas Australian Tourism Awards on 1 March 2019. 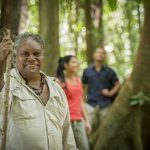 Following Mossman Gorge Centre’s Queensland Tourism Award win in 2016, it went on to win a Bronze award for Aboriginal and Torres Strait Islander Tourism at the Australian Tourism Awards.